Not to be confused with Eastern meadowlark. Western meadowlark adults have yellow underparts with a black "V" on the breast and white flanks streaked with black. Their upper parts are mostly brown, but also have black streaks. These birds have long, pointed bills and their heads are striped with light brown and black bands. These birds have a flute-like warbled song. These calls contrast with the simple, whistled call of the eastern meadowlark. The breeding habitats of western meadowlarks are grasslands, prairies, pastures, and abandoned fields, all of which may be found across western and central North America, as far south as northern Mexico. In regions where their range overlaps with the eastern species, these birds prefer thinner, drier vegetation; the two type of birds generally do not interbreed but do defend territory against one another. Their nests are situated on the ground, and are covered with a roof woven from grass. There may be more than one nesting female in a male's territory. Nests are sometimes destroyed by mowing operations with eggs and young in them. These birds forage on the ground or in low to semi-low vegetation. They sometimes search for food by probing with their bills. They mainly eat insects, although they will consume seeds and berries. In winter, these birds often feed in flocks. 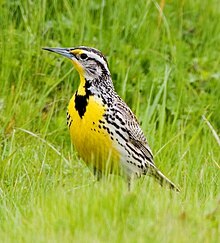 The western meadowlark is the state bird of six states: Montana, Kansas, Nebraska, North Dakota, Oregon, and Wyoming. The northern cardinal, which represents seven states, is the only bird to hold the status of state bird in more states. During the 2017 regular session of the Oregon Legislature, there was a short-lived controversy over the western meadowlark's status as state bird versus the osprey. The sometimes-spirited debate included a legislator playing the meadowlark's song on his smartphone over the House microphone. A compromise was reached in SCR 18,  which was passed on the last day of the session, designating the western meadowlark as the state songbird and the osprey as the state raptor. ^ BirdLife International (2012). "Sturnella neglecta". IUCN Red List of Threatened Species. Version 2013.2. International Union for Conservation of Nature. Retrieved 26 November 2013. ^ Audubon, J. J. (1884). "Missouri Meadow-lark". Birds of America. 7. Philadelphia: E. G. Dorsey. pp. 339–341. Pl. 489. ^ Jaramillo, Alvaro; Peter Burke (1999). New World Blackbirds: The Icterids. London: Christopher Helm. p. 305. ISBN 0-7136-4333-1. ^ "Lawmakers adjourn 2017 session with mixed results for biggest priorities". OregonLive.com. Retrieved October 15, 2017. ^ "SCR 18". state.or.us. Retrieved October 15, 2017. Wikimedia Commons has media related to Western meadowlark. "Western meadowlark media". Internet Bird Collection.